The 2014 Formula One season is rapidly approaching, and with it comes the reveal of new machinery from the teams. There may not be as many launch events as in previous years, but the anticipation ahead of the unveiling of this year's F1 cars is still as high as ever. With so many regulation changes to implement, teams have been working feverishly on their new designs, and now we get a glimpse of the results. Whilst the launched cars may not resemble what hits the grid in Australia, it's our first chance to see just what is going on with the new noses, and which teams have revamped their liveries for the coming year. It's an opportunity to cast our eye over the cars before they hit the track in testing. Stay tuned to the logbook over the next few days as we follow the launches and all the reactions. Hello and welcome to the Factbyte Factbox, covering all the handy information you need to know about Formula One's pre-season launches for 2014. We'll have pictures and links, tweets and reactions for all the launches heading into testing next week, so stick with us as we get the 2014 pre-season started! A few teams have already given us some sneaky peeks at what is in store, with Caterham in particular rebranding with a whole new colour scheme, and confirming their drivers while they were at it.. Although not revealing the paint job on the car at the time, team boss Tony Fernandes did post a side on shot that showed the lime green Union flag in full display on the Caterham car, and on the sidepods of the F1 car. Picture via @tonyfernandes. Not to be beaten, Force India revealed some computer renders of their own new paint job, featuring an awful lot more black. 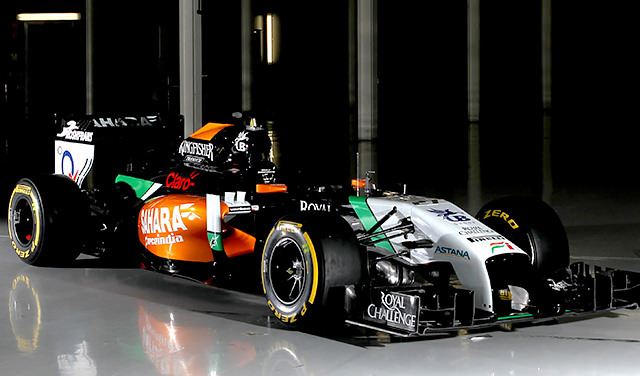 There are a handful of new sponsors on the car as well, as Force India prepare for the year ahead. There's been a lot of consternation about what shape the noses will take this season, and Williams gave us our best look at one so far... to mixed reviews. 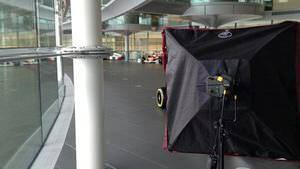 McLaren look set to be the first car to officially launch, with an online reveal expected tomorrow - 24th January at midday. McLaren have journalist Alan Henry writing on their blog about the best of the exciting launches in F1 and otherwise. I also wrote a post about this. It's a good read, that post. "In 1980 I think, the press corps was at a fever pitch as it crammed into London’s Albert Hall... Holding our breath as Mario Andretti, perched precariously in the cockpit of his brand-new racing car, was lowered into view... We all enjoyed the frequent moments of obvious anxiety with a chuckling Mario all the way down to his gentle, if unorthodox, landing. All of us agreed that it was possibly the quirkiest Formula 1 car launch we’d witnessed theretofore." Surprising news this morning, with the departure of Éric Boullier from the team principal role at Lotus. Along with the statement comes an official date for launch of the E22, on the first day of the Bahrain test, 19th February. Meanwhile, Ferrari have officially confirmed the name/number of their new car. The polls are closed and F14-T won the vote. Refresh your McLaren page for a reveal of the new (and rather odd looking!) car. Lots of technical detail in there, such as about the gearbox: "Epicyclic differential with multi-plate limited-slip clutch." But we care about what it looks like. 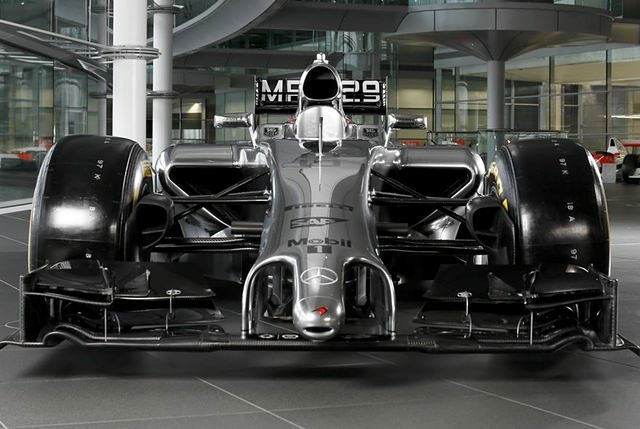 The car is launching without a main sponsor, so has a totally silver paint job, with black front and rear wings. Bigger sidepods, a boxy look at the back, and of course that weird nose thing. From the comments, elephino says: "It's even ruder than the Williams." 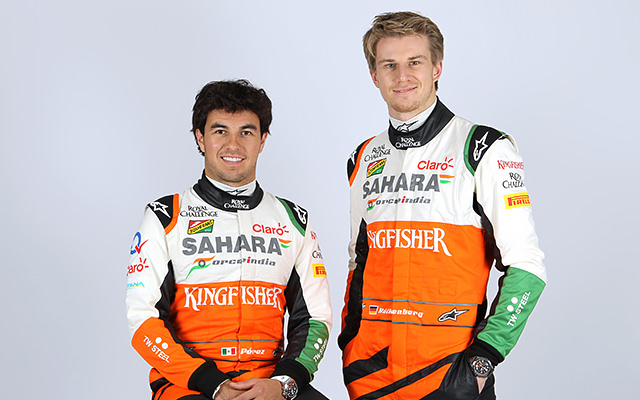 A picture of the drivers next to their new car, the sparse overalls are odd! Meanwhile, Lotus try to grab yet more of the attention for the day, with their own picture. Different take on the nose. From the comments, SchuMARKer: "Let's look at the good news, the cars look different from each other!" Tweet from @Autocourse1: Last year's McLaren was pretty but didn't work, this year's McLaren is less than pretty to say the least, might win a few races! Lots of videos uploaded to the McLaren YouTube channel. Talk from Sam Michael about the technical aspects here. Kevin Magnussen: "The car this year’s going to behave very differently to the old car. It has generally a lot more power than last year and downforce is different. It’s very fun, it’s going to be a big challenge. In a way it’s good for me as it puts every one on zero again in terms of driving style." Jenson Button: "There’s going to be a lot of development this year. I think being with a team like McLaren will be very important, we are very good at developing, we’ve seen that in previous years. It’s going to be a development race during the season as well as trying to get a handle on the reliability of the car." Sam Michael: "At McLaren at the moment, the preparation is huge. There’s a hive of activity downstairs where we’re building cars, checking them and signing them off, then shipping them off to test. We’re producing chassis, introducing an upgrade kit for the first race. We run a night shift during the test as well, to help the mechanics and technicians just cope with the workload." Jonathan Neale: "We’ve had amazing reliability brought on by some of the changes in the regulations, I think we’re going to take a big reset on that, it’s a huge challenge for everybody. That’ll make for some really exciting races because there are going to be some thrills and some spills, and that unpredictability always adds a bit of drama if you’re sitting in the armchair at home, but a bit of stress if you’re trying to run a Formula One team." Tweet from @JennieGow: Feel a bit sorry for Martin Whitmarsh - no mention of him in the latest press release. Always found him good to talk to. This is the one time I hope Lotus are trolling the internet. Wonky nose, I ask you. Mercedes have completed a shakedown of their car today: "The F1 W05 has run for the first time! 40 km completed this afternoon at Silverstone. 2014 has begun." Meanwhile, Kvyat and Vergne have both completed filming days with the STR9 at Misano. It's all about Ferrari today. Well, it's Ferrari's online launch day - whether other teams decide to get in on the action and steal some thunder is yet to be seen! 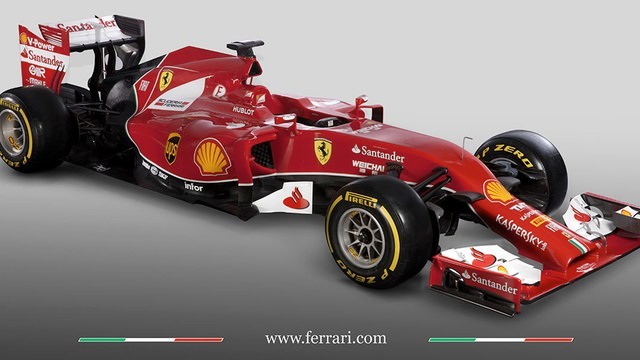 Ferrari launch the F14 T.
Ferrari describe the challenges presented by this year's regulations. "Externally, the car is very different to the cars of recent years: changes to the regulations to lower the chassis and nose in the interests of driver safety give the F14 T a very different appearance to the F138 and presented the designers with a real challenge to repackage the front suspension into a much lower monocoque. "The 2014 rear wing family shares nothing with the previous year owing to three rule changes requiring a much larger stroke DRS, a much smaller overall rear wing depth and removal of the beam wing, thereby requiring the main plane to be supported by central pillars." 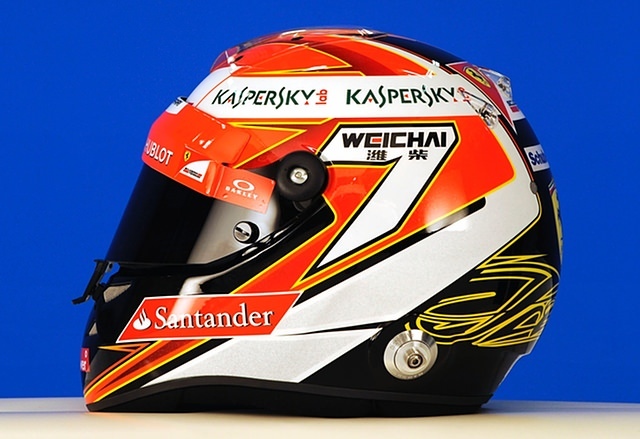 Alonso's lid meanwhile appears largely unchanged with only the addition of his number 14 on the top. "This year will be more complex because we have to add into the equation a new approach to fuel efficiency that has to be dealt with in the best way that we can. It is important to start with a very reliable car in the beginning and keep up the development that was not there last year". Stefano Domenicali, team principal. Comment from Steven, "The good thing is that we have another car that looks different. So far we have 3 entirely different nose ideas. I hope they don't all ending up copying one of them." A fun video released by Ferrari - Motion timelapse stickering of the F14 T.
Amusingly, pre-sticker application, the Ferrari is a dead ringer for the Marussia. 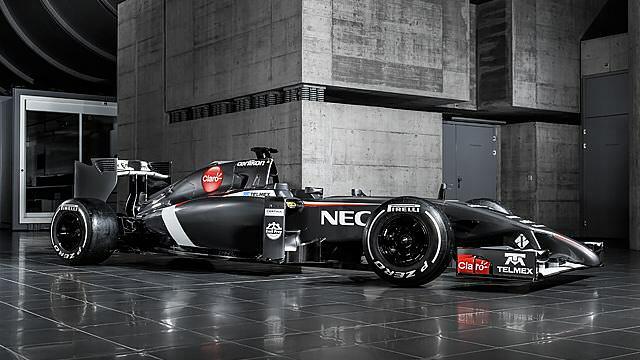 Sauber have released the first image of their 2014 car - the C33. There's an awful lot of technical information available on Sauber's launch page, including: "Perhaps the most visually striking element of the Sauber C33-Ferrari is the very low, snout-like nose. The front wing pylon’s attachments on the nose have been moved out as far as possible allowed by the regulations to channel as much air as possible under the car." Interview with Monisha Kaltenborn: "In Jerez, we’ll be having our roll-out and that’s always a special moment because first of all we’ll see if everything really fits together and if the car is running well. It also tells us if we’ve been working in the right direction for the last nine months. All of this together makes it a very emotional moment. "Due to the big changes on the chassis side, but particularly on the drivetrain side, it’s practically impossible to give an indication of our competitiveness. We can do this at the earliest after the winter test, particularly when we have seen where we stand compared to our competitors. As always, it’s going to be our target to improve our position in the championship. "This year we have a very exciting driver lineup. On the one side we have Adrian, a very experienced race driver and I’m happy we finally have the opportunity to work together. On the other side we have Esteban, a talented race driver who we know since many years, who’s also been a member of the team. "That’s very valuable considering the big changes that are upcoming in the season. I hope that the drivers can come to know the car very quickly, that we have all our reliability issues sorted out, so that together with the drivers we can work on the performance and develop it further." You can see Monisha in action in a new video. She may or may not be reading her words. There's also talk from Sutil and Esteban. Pérez and Hülkenberg model Force India's new range of team gear. Your essential 60 second round up covering Sauber's C33 launch. 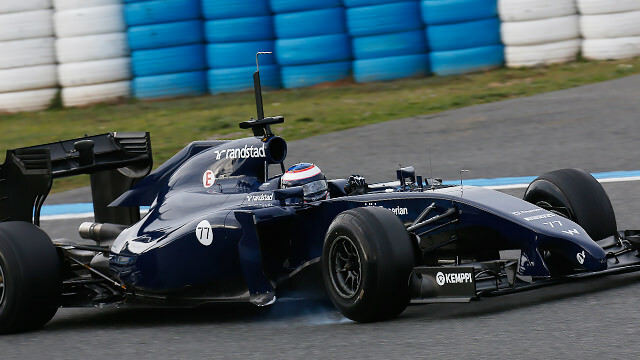 Another day, another launch, as Toro Rosso unveiled the STR9 in the Jerez pitlane. 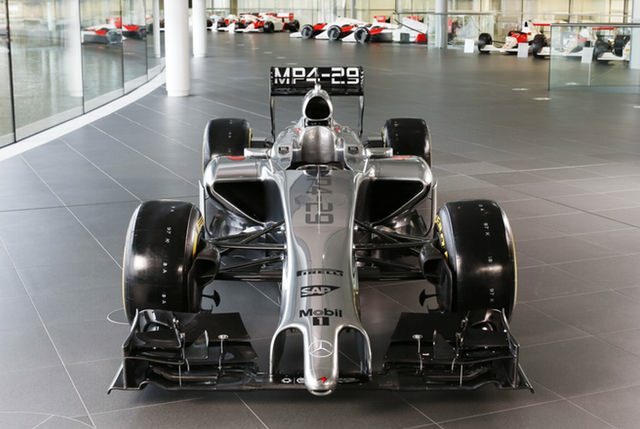 Just as McLaren and Sauber before them, they've opted for the single dip nose. Technical Director, James Key, has offered up some thoughts on the evolution of the car: "The installation of the power unit is in itself a big challenge, dealing with the cooling circuits and other related elements, but the chassis and bodywork regulations have gone through quite a big change as well and the cars look quite different this year in some areas. So a big part of the chassis development has involved redeveloping the aerodynamic philosophies in line with the new regulations and getting them to work with all the other challenges that come along for 2014." Chief Designer, Luca Furbatto, talked up his colleague's work on the new car: "When James Key arrived in late 2012, he focused mainly on the 2014 car in terms of planning, simulation targets and internal resourcing whilst we were still designing the STR8. To his credit we were able to perform the first STR9 wind tunnel test shortly before Christmas 2012, much earlier than previous Toro Rosso projects." There's a picture or two floating around from the actual launch, very red carpets as per usual. Tweet from @Jamesallenonf1: Ah now then! The new Toro Rosso has got to be known as the "Bottle Nose", after the Dolphin, surely? Testing kicks off tomorrow, and there are four teams set to launch their cars in the Jerez paddock before the session gets underway. 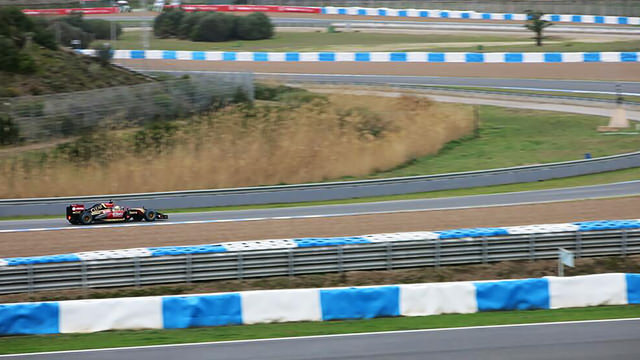 We've seen a handful of muted launches and online reveals, but today four teams were set to launch and then send their machinery straight out on track for the first day of testing in Jerez. Already we've had a slight delay to proceedings, with Caterham postponing their launch. Tweet from @CaterhamF1: "Right, quick update. Unfortunately we're going to delay our 0845 launch as we're having some last minute issues bolting it all together...."
Their latest update is about lunch, so they're obviously taking things easy today. 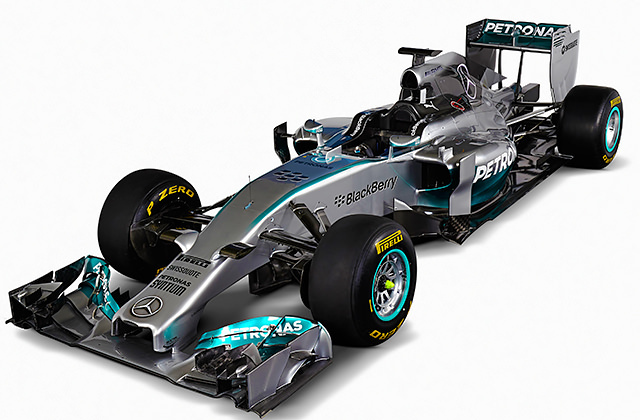 Mercedes were next up to reveal their machinery, with a slightly more palatable nose. A bit like the Ferrari, but far less hoover-like, the nose isn't so bad, but the front wing looks excessively complicated! The blue/green on the side is a slightly different colour to last year. I like it. Executive Director (Technical), Paddy Lowe: "We have hit our milestones and hit our targets but, as ever, we will only begin to understand how successful we have been once we begin running in anger on track. The new car is an elegant but aggressive design and, as is often the way, its beauty is much more than skin deep." Running in anger describes it perfectly, as Lewis Hamilton took to the track this morning and crashed into the barriers. Front wing gone, debris everywhere. The team confirmed a front wing failure, and they're looking into it. 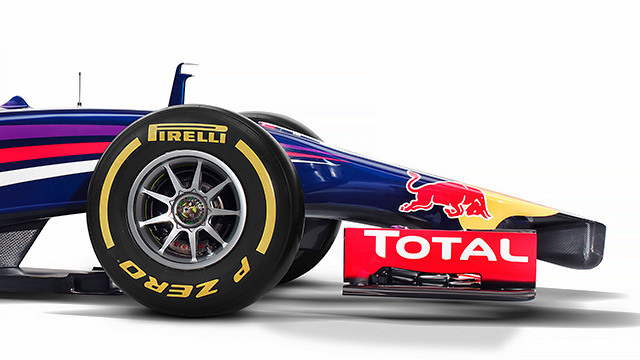 Defending champions Red Bull launched their 2014 car this morning, with yet another take on the nose situation. A side on view of the nose. 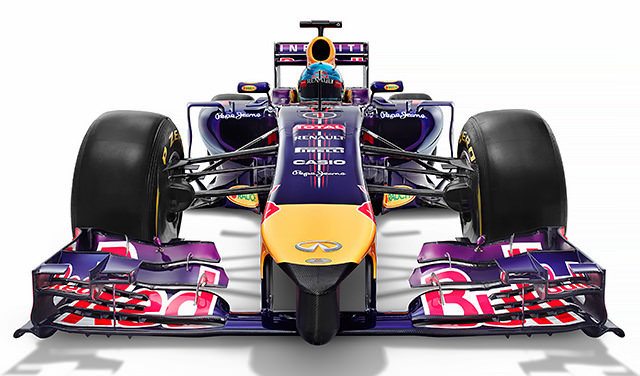 Red Bull have painted this so its full impact is hard to gather, but it looks quite shark-fin-esque and very pointy. 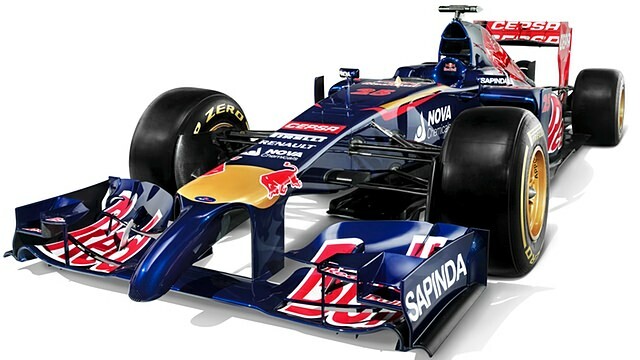 Adrian Newey has admitted that the new noses aren't what the FIA had in mind and could be just as dangerous as before. "If you hit the back of the car square on, then you go underneath it and end up under the rear crash structure, which I think is a much worse scenario." Christian Horner: "It's a clean sheet of paper and an opportunity for the design team to get their teeth into a new challenge. The biggest challenge is in the power unit and that's where we rely heavily on our engine partner Renault to make sure that we have a power unit that is competitive with our rivals. We have every confidence they will have. 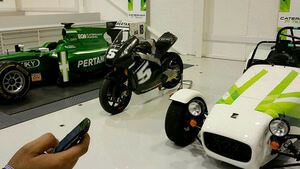 "I think it will be a different type of racing. We're limited to 100kg of fuel for each race, so there will be a more tactical approach and that will be a challenge for all the teams and drivers. "The atmosphere in the team is excellent. We've been riding the crest of a wave over the last four years and there's a great determination to see that continue in 2014. It's been the most intense winter we've ever had. We've produced the car in the shortest possible amount of time and it's fantastic to see the team operating the way it has." A jam-packed morning of launches continued with Force India, who have shared images packed full of shadows so you can't really see the full impact of the nose. Chief Operating Officer, Otmar Szafnauer: "The chassis is completely new and all the systems are new. As a smaller team you don't have the resources to do all the required experiments in order to give you the best solutions for some of the problems. Sometimes we have to take a best guess – an educated and scientific guess – as to what the solutions should be. When you don't have all the data, and when you are making some decisions that way, you could be right in your guesses. But if there are a lot of them compared to your competitors, it just introduces more risk." Sergio Pérez: "I'm joining a new team at a time when Formula One is entering an exciting new era, so I think that gives us good chance of doing well. It will be very important that we work very hard during winter testing to understand how everything works and how we are going to get the best out of the package that we have." Pérez has also explained his choice of driver number (11) saying: "I will be wearing it the rest of my career, except when I win the World Championship, when I will be wearing number one!" Which is some epic confidence right there. 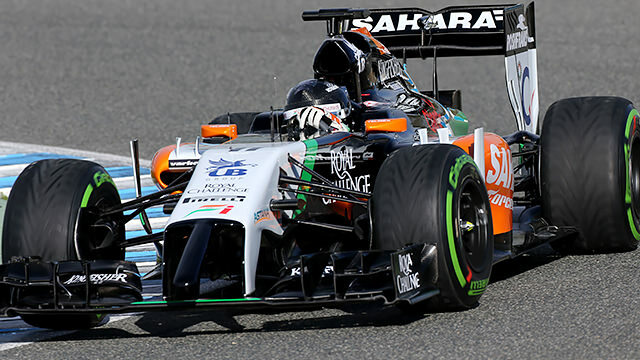 Sergio Pérez hits the track in Jerez, to give us a better view of the Force India nose. Better is not the right word. Tweet from @WilliamsF1Team: For those waiting to see the #FW36 you will have to wait a short while longer but I promise you we'll have her on track as soon as we can! In the meantime, a good interview with Claire Williams shows some grit and determination: "We have to make progress. I think that’s the single most important message for this year. We finished ninth in the championship last year and that was disappointing for everybody at Grove. We all know we have to do better; there is no alternative." After that glut of launches, we're expecting Williams and Caterham at some point today. 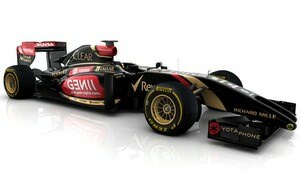 Marussia are expected at Jerez tomorrow, whilst Lotus aren't prepared to show off their car until Bahrain. 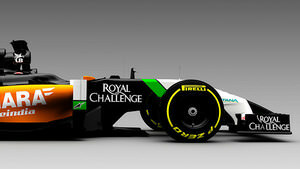 Caterham unveiled their new car today, and it's definitely one of the more distinctive noses we have seen. Mark Smith, Technical Director: "At the front of the car, the area that will obviously inspire most debate, we have focused a lot of effort on optimising flow structures around the nose, the front of the chassis and the reduced-width front wing area, all in response to the 2014 regulation changes. However, the package we start testing with is by no means our definitive answer and we fully expect to evaluate alternative solutions throughout the course of 2014." 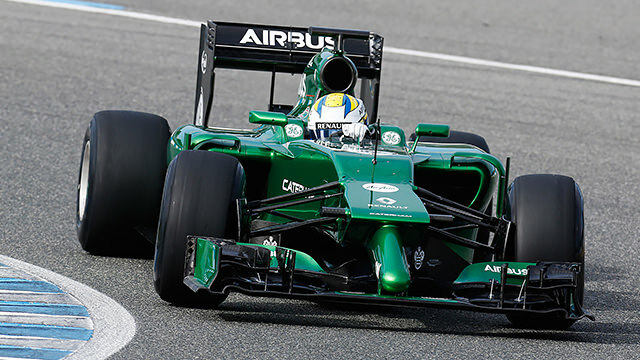 Caterham ran just one installation lap in Jerez, after an engine issue cut short their day. The team have faith in their engine supplier though, team principal Cyril Abiteboul said: "In Renault Sport F1 and Red Bull Technology, we have technical partners that have powered the World Championship-winning team for the last four years and, while we are realistic enough to know we are very unlikely to be competing at the front of the grid, there is no reason why we should not be fighting higher than we have done since we came into the sport in 2010." The final team to reveal their new machinery today was Williams, who had seen a small delay to their planned schedule but finally hit the track with the FW36. Previously, we might have been negative about this nose, but frankly, it's one of the nicer ones of the selection so far. That just leaves Marussia to launch, hopefully tomorrow, and then Lotus whenever they decide to reveal their car. That will conclude the 2014 pre-season launches, and we can start to take the time to get used to the new look! A fitting quote from Toro Rosso boss Franz Tost: "Kids should be dreaming when they see an F1 car - I don't know about the dream or nightmare you will be having when you look at those cars." 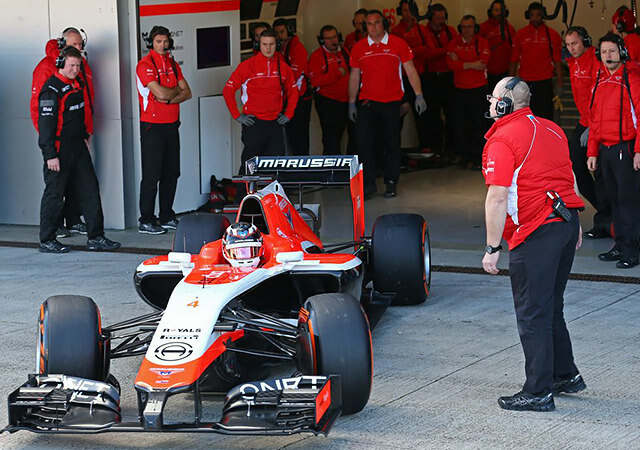 Marussia finally unveiled their 2014 machinery today, having arrived at Jerez and settled in. The team only managed five installation laps, but gave us a good look at their car while they were at it. This nose looks a bit thinner, bit more spindly than others we have seen. Chief Designer, John McQuilliam: "Without doubt, the greatest design challenge has been in terms of cooling, yet this is one of a few areas where we are not only very pleased with the design response, but also the degree of innovation we have achieved with our solution. "All-new front and rear suspension layouts are a product of the new aerodynamic regulations placing greater emphasis on mechanical performance, with the mechanical systems now having far greater real road relevance." 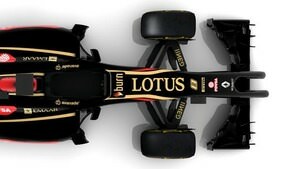 A glimpse at the new @Lotus_F1Team car. Having missed the first test, the Enstone team headed to Jerez a little on the late side and completed all the promotional mileage they are allowed in order to get up to speed. Alan Permane, trackside operations director: "Both the chassis and the new Renault power unit ran without any major problems. Pastor settled in very quickly and is already fitting into the team nicely. The car went together well and the design and build quality is another step up on the successful E21 of 2013." That wraps up the launches for the 2014 season, we've seen each and every car in all their... erm... glory. A handful of pre-season testing dates awaits the machinery, before we get to see them in anger at Albert Park. They're likely to have changed a lot since our first glimpses here, but that is all part of the fun. So, stay tuned to Sidepodcast for all the testing information you need, and we'll meet back here just in time for the Australian Grand Prix.